Traditionally Diwali was always the festival of lights but somewhere along the line, we turned it into a festival of smoke, noise and waste! Last year when the Supreme Court put a ban on the sale of firecrackers in Delhi and NCR region, I was baffled to see that instead of welcoming and lauding the decision, some people (even some celebrities) condemned the judiciary as being Anti-Hindu and religiously biased, with such quotes as "this country only bans Hindu traditions" coming from some quarters. I wonder which Hindu scripture mentions the use of firecrackers during Diwali that these people think bursting crackers is an indispensable part of the Diwali tradition! Let's accept this - we are slowly and gradually becoming inconsiderate and have turned very self-centred, we are not able to see beyond ourselves, our joy, our happiness. All of us have got fundamental rights (including the right to celebrate a festival), however those rights also come with some responsibilities. Our celebrations should not, in any way, cause discomfort to others! Our enjoyment should not in any way disturb the society and harm the nature. Sadly, the exact opposite is happening. As it is, the bigger and louder varieties of the firecrackers are the most popular ones. I wonder what pleasure and what high could one derive from a succession of loud explosions? Personally speaking, I see no good reason to burst crackers - one would only be wasting money, adding waste to the environment, and causing discomfort to others. But then, to each his own. Agreed that Diwali is a one day affair and people have every reason and right to celebrate the festival. However what some of us so conveniently ignore or overlook is that there are scores of people around them who suffer from this torture for no fault of theirs - the babies, the new-borns who would not have been exposed to such loud sounds and toxic air, the young children and the elderly people. They are forced to stay indoors. So many animals and birds, unable to voice their fear and discomfort, suffer in silence every year due to the increased decibel levels and the smoke. Spare a thought for the stray animals, especially dogs who have very sensitive ears. They become extremely frightened but have no where to go and hide! As per a study, the pollution levels in Delhi during Diwali goes up to nearly 30 percent! The situation turns grim every single year around this time due to the burning of crackers. I have witnessed the smog and the haze the day after Diwali, since my school days. And it remains so for almost a month or thereabouts, not just for one day. Of course, I agree as some people might argue that crop burning during this period and vehicular pollution too are the contributors. However, how can we be so unconcerned and apathetic about the damage we cause to the ecology on just one Diwali night by burning crackers, which almost equals the amount of pollution that is caused over an entire year? Not just that, our streets are invariably strewn with burnt-out crackers the morning after Diwali. But then, that's how we are - after the celebrations are over, we no more care about the trash we created! As per the estimates, the garbage produced goes up to nearly 1,500 tonnes on the day after Diwali. Let's not contribute to the already enfeebled health of this planet, can we? The Diwali celebrations in Delhi last year had turned into a nightmare for many people, especially the children, the elderly and those with asthma or bronchitis. They were left gasping for breath due to high levels of toxicity in the air caused by burning of firecrackers. Even being aware of this, if some people still willingly burn crackers, they would be endangering everyone's lives. The Diwali smoke might trigger another smog in Delhi this year too. 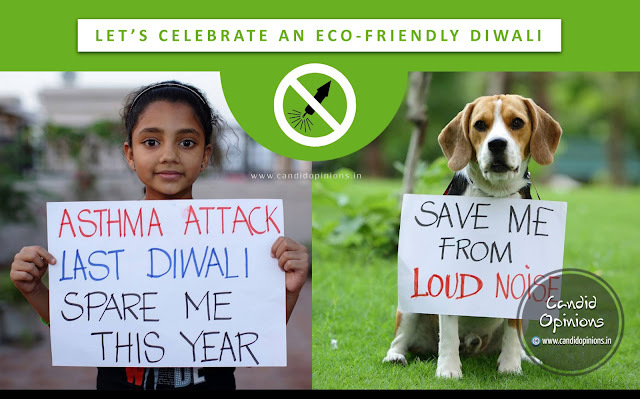 So this time, let's give up our "Saanu Ki" mindset and instead celebrate an eco-friendly Diwali sans firecrackers - a cacophony-and-smoke-free Diwali. Let's make this festival delightful and pleasurable, not just for us but for everyone around. Absolutely true. People have become so insensitive and selfish that they do not care or think about others and especially the harm they cause to the environment when they burn crackers. Besides the noise and the smoke that causes so much of problems to the old people and the babies, the massive amount of waste that is produced, actually adds to the burden on the earth! The enthusiasm these people show while burning crackers suddenly vanishes away the next morning when one finds waste lying everywhere around and no one bothers to clean up the mess. It's like that is not their problem or responsibility. More importantly, with time, people are increasingly becoming so rigid that they don't even want to listen to your requests or complaints or spare a thought about those who get inconvenienced by their acts. Diwali is a festival of lights and is meant to spread happiness, not to cause inconvenience to others. The festival never had this cracker thing associated with it!